It may now be safe for cyclists who want to get some exercise — as opposed to waiting for lights to turn green or for officers to finish writing $270 tickets — to return to Central Park. At a meeting Wednesday night with representatives of groups that use the park’s loop road, the Central Park Precinct’s Community Affairs Officer Richard Tombari strongly implied that the precinct’s enforcement approach has shifted from its previous and punitive zero-tolerance stance. While stressing that “the law is the law” and that cyclists will never get an official announcement of relaxed enforcement, Tombari told meeting attendees that officers have “discretion” and that their focus is now on reckless cycling. He offered several examples of what might be considered reckless riding, including racing through a red light when pedestrians are in the crosswalk. None of his examples involved a cyclist riding through a red light when no one is attempting to cross. It was unclear whether officers’ use of discretion is limited to car-free hours or whether it extends to places and times when cars are in the park. Tombari’s comments came during a meeting of the Central Park Conservancy’s Recreation Roundtable, a loosely structured advisory group that works with the Conservancy on recreation issues in the park. Supporting the suggestion of a more relaxed enforcement regime is the fact that none of the representatives of the cycling organizations in the room knew of a red-light summons having been issued to a cyclist in the park in the past several weeks. In addition, on April 6, citing a reliable source, the New York Cycle Club announced to its members that a pilot program is underway in which the police will not enforce red lights in Central Park between the hours of 6:00 a.m. and 8:00 a.m. on weekdays, barring reckless or dangerous riding. At the same time, the lights on the loop road were permanently synchronized to 25 miles per hour, presumably as an accommodation to fast cyclists. While it appears that cyclists will never get explicit confirmation from the NYPD, after Wednesday’s meeting it seems fair to conclude that the NYPD is now pursuing a more rational policy of focusing enforcement on reckless cycling and is unlikely to ticket cyclists riding through red lights at deserted intersections, at least when that section of the loop is car-free. A meeting attendee asked about trends in the enforcement of rules against counterflow riding on the drives and equipment violations, and Tombari said he would provide a response. But as long as the NYPD is unwilling to explicitly pledge that it will not ticket cyclists simply because they go through a red light — or as long as the city insists that traffic laws apply to cyclists in parks during car-free hours — riding a bike in Central Park remains, legally speaking, a dicey proposition. (Dicey, that is, unless you can maintain an average speed of 25 mph, which seems like a crazy thing for anyone to be encouraging at this point.) 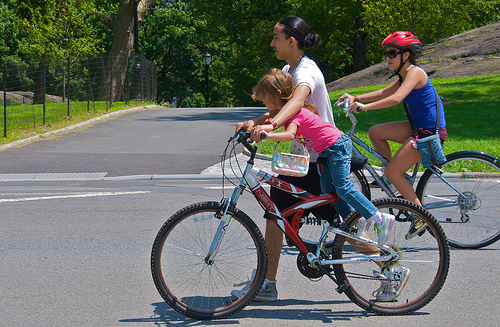 Changing the lights to flashing yellow during car-free times, as legislation introduced by City Council Member Ydanis Rodriguez calls for, appears to be the only current route for legitimizing recreational cycling in the park once more. Rodriguez’s bill now has 11 co-sponsors, although the Department of Transportation reportedly opposes it on the grounds that it would confuse pedestrians. Will the “Central Park Shuffle” – a ticket-avoidance strategy employed by some in which the rider dismounts and runs through the red light cyclocross-style – become a vaguely remembered relic of a fleeting period of civic madness? Perhaps, but you might not want to clip in too tightly just yet. Steve Vaccaro assisted with reporting and writing. The only reason why the NYPD is backing off their zero tolerance approach in CP is because they would never be able to fully enforce the “law” with the increase in numbers that spring and summer bring to the park. No, but they could write tickets all day, which is fine with them. Perhaps another factor is backing off the crackdown is the constituency that uses central park. There are no doubt some very wealthy and possibly influential people who ride in that park. You’re definitely correct about the influential users of the park. After all, they did apologize to those cyclists who where given speeding tickets a few weeks back. I have to think that the NYPD ticketed the wrong guy/gal that day. Someone with enough power to make a single phone call and reverse all those tickets. But the NYPD is not stupid either and they very well know that they can’t ticket all day long with out consequences. Even the Post is now criticizing the ticket given to that woman with a handbag on the handlebars. My point is that they took advantage of the low number of cyclists during the chillier months to make a statement. That statement being: “NYC does not like bikes and we don’t endorse the behaviour.” The NYPD knew all along that it would not be possible to continue their ticket fest through out the year. Unfortunately it’s part of our culture, our car culture that is. But that doesn’t mean we can’t change it. It’ll take time an effort but it can happen. We are about three decades behind from places like Paris, Amsterdam, and Coppenhagen. They too went through the same trials and tribulations we are going through right now. If there were any “very wealthy and possibly influential people” who wanted to stop the harassment of bicyclists in Central Park, cars would have been banned there a long time ago. And taken the traffic lights with them. I disagree, although at some point they might start to be more careful about who they ticket and why. This is actually pretty reasonable: when I’ve ridden in the park on weekends, I am embarrassed to see frightened pedestrians race through cyclist hordes speeding through the crosswalk. I’m thinking West 81st Street, at the bottom of a hill in which they literally run through the crosswalk. You want to alert cyclists to stop for pedestrians in crosswalks? This is not rocket science, or even brain surgery. Post brightly colored signs at each crosswalk that say “MUST STOP FOR PEDESTRIANS IN CROSSWALK”, and back it up with enforcement. Paint the crosswalk the same bright color so everyone knows where the crosswalk is. Turn off the damned traffic signals during non-car hours. Ty has it right: Central Park is a park (duh), and pedestrians in a park should have the right of way at all times. Doug, I share your feeling. There are too many of us that blow by pedestrians and make a really bad name for the rest of us. It is unfortunate but I see it all the time. Not long ago I was riding down the Greenway by the Hudson when I stopped at a red light for pedestrians to cross over. The first guy looked over to me and was shocked to see me just waiting for the light to turn green and/or pedestrians to finish crossing. He then turn over to his buddy and said: “this is the first time I see a bike stopping at one of these lights for us”. Another instance (also on the Greenway), as I was riding north by the Sanitation Dept. the light turn red for us. I stopped and the guy behind me on a folder also stopped. There was a car attempting to pull out and make a right onto the HH Pkwy. I can attest to the fact that the driver was being extra cautious even though by now she clearly had the green light. On the south bound lane comes a cyclist with no intentions to stop and although at this moment she had already advanced enough to block the south bound bike lane the cyclist veered into the north bound lane to cut in front of the driver while gesticulating a barrage of insults. What I’ve noticed is that we all (drivers, bikers, pedestrians) feel like we have an overgrown sense of entitlement. People in general are too willing to jeopardize their own safety and that of others for the sake of their ill perceived rights. I don’t see any rationality yet. I got a summons for “reckless driving” in Central Park last week — for supposedly running a red light at a crosswalk that I actually stopped at, to boot. If anyone knows whether VTL 1212 can even apply to bicycles, I’d love to know. Their are downsides to bikes. 1) Half the time conditions are bad: cold, rain, hills, thugs, muggers. 2) Can’t carry a lot of stuff. 3) Sweat. Many leftists don’t care much for hygiene; yours anyway. 6) If your a man, not good for your junk. Good luck having kids in the future. Sorry, if cyclists run the red lights, they deserve tickets. Of course they can enforce it in the warm months as well. It will be easy picking. They can issue countless tickets, make some money for the city, and cyclists will eventually get the message. I am all for enforcement. Anton, are you for intelligent enforcement of actual safety issues, or are you for quota-based enforcement of technical (or even nonexistant) violations? Also, do you think the NYPD should focus its enforcement resources towards lawbreaking cyclists or toward lawbreaking motorists, and why? Car-free Central Park is anything but.